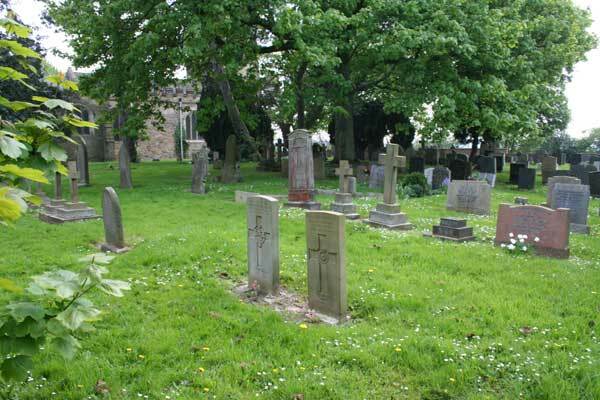 1 soldier of the Yorkshire Regiment is buried there. The grave of Coy Sgt Major H Atkinson, DCM & Bar, in the Churchyard of St. John the Baptist Parish Church, Egglescliffe (County Durham). Beside the grave of Herbert Atkinson is the grave of M H Atkinson, DSC, - son of Herbert Atkinson. Company Sgt Major Herbert Atkinson, DCM and Bar, 203809. 4th Battalion the Yorkshire Regiment. Son of Thomas and Florence Atkinson, of Myrtle Rd., Eaglescliffe; husband of Emily Jane Harrison (formerly Atkinson), of Westland's Rd., Egglescliffe. Died 6 April 1918. Aged 27. Buried EGGLESCLIFFE (ST. JOHN THE BAPTIST) CHURCHYARD. Born Eaglescliffe (Yorks), Enlisted Northallerton, Resided Saltburn. For supplementary information on CSM Atkinson, see below (at the bottom of this page). St. John the Baptist Church, Egglescliffe. Company Sgt Major Herbert Atkinson, DCM and Bar, 203809. 4th Battalion the Yorkshire Regiment. Died at home on Saturday, 6th April 1918. Age 27. 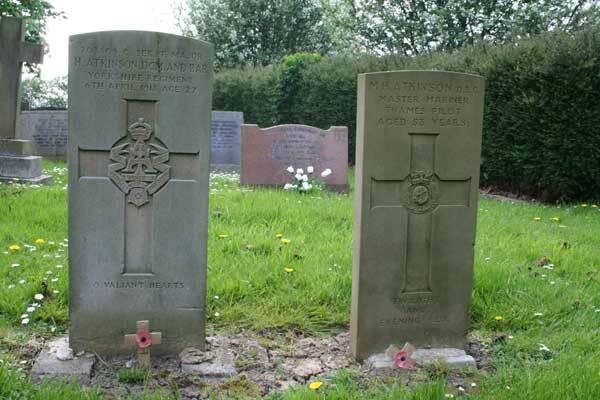 Buried in Egglescliffe (St John the Baptist's) Churchyard with full Military Honours on Thursday llth April 1918. Son of Thomas and Florence Elizabeth Atkinson (nee Leggart) of Myrtle Road, Preston-on-Tees. Husband of Emily Jane Harrison (formerly Atkinson) of Cross Row, Egglescliffe Village and father of Maurice and Cecily. Company Sergeant Major Atkinson, had been in the Territorials and joined the Yorkshire Regiment in August 1914. He served on the Western Front. Wounded three times and died of wounds on Saturday 6th April 1918 whilst in hospital at Bournemouth. Herbert Atkinson, born 189, was the son of Thomas and Florence Elizabeth Atkinson (nee Leggart) of Myrtle Road, Preston-on-Tees. His Father was a Railway Signalman (born 1865 at Egglescliffe). His mother was born 1862 at Lowestoft. His Parents were married in Egglescliffe Parish Church on Thursday 3rd December 1885. Thomas and Florence had at least seven children. Annie -1887. Thomas -1889. Herbert -1890. Edith -1891. Frank-1894. Elizabeth -1896. John -1890. C.S.M. 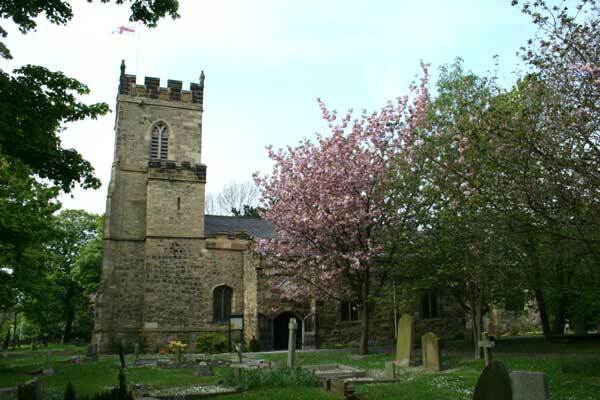 H. Atkinson married Emily Jane Main of Egglescliffe Village on Friday 6th June 1913, at which time he was a gardener at Holy Trinity Church - Stockton-on-Tees. They had two children, Maurice Herbert, who was born on Wednesday llth November 1914. Cecily was born on Sunday 20th May 1917. On the 28th March 1918. The London Gazette published the award of the Distinguished Conduct Medal to Company Sergeant Major H. Atkinson, No 203809 Yorkshire Regiment. "For conspicuous gallantry and devotion to duty on two separate occasions by digging out men who had been buried by exploding shells. He was finally buried himself and on being dug out fainted. Although severely bruised and shaken he remained with his company until relieved." On the 3rd September 1918, published in the London Gazette, was the award of a Bar to the D.C.M. to Company Sergeant Major H. Atkinson. "For conspicuous gallantry and devotion to duty. This warrant officer was most capable and energetic in rallying the front companies at a critical stage, when the left flank had given way under intense machine gun fire. When the Commanding Officer and all senior officers had become casualties he assisted the officer who assumed command in collecting stragglers, reorganising the battalion and establishing a system of defence, until wounded a day or two later. C.S.M. H. Atkinson's medals are located in the Medal Room of the Green Howard's Museum Richmond, North Yorkshire. With his D. CM. and Bar are three World War Medals, the 1914 Star, The British War Medal 1914-1920, and The Victory Medal.